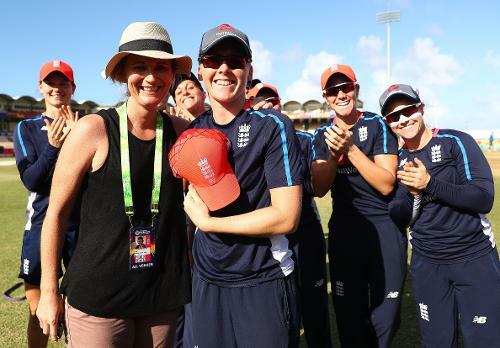 Heather Knight of England is presented with her 50th cap from former England captain Charlotte Edwards during the ICC Women's World T20 2018 match between England and South Africa at Darren Sammy Cricket Ground on November 16, 2018 in Gros Islet. 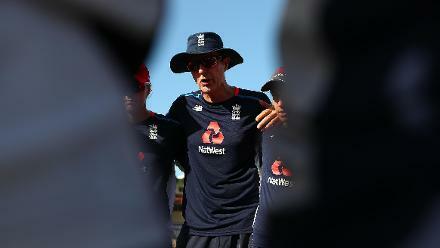 Mark Robinson, Coach of England talks to his team during the ICC Women's World T20 2018 match between England and South Africa at Darren Sammy Cricket Ground on November 16, 2018 in Gros Islet, Saint Lucia. 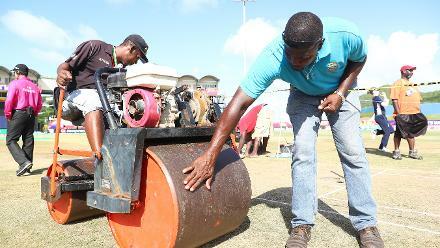 Groundsman Kent Crafton in action during the ICC Women's World T20 2018 match between England and South Africa at Darren Sammy Cricket Ground on November 16, 2018 in Gros Islet, Saint Lucia. Danielle Wyatt of England arrives ahead of the ICC Women's World T20 2018 match between England and South Africa at Darren Sammy Cricket Ground on November 16, 2018 in Gros Islet, Saint Lucia. 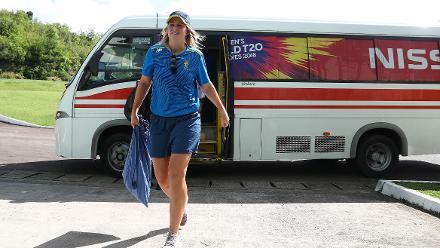 Dane van Niekerk of South Africa arrives ahead of the ICC Women's World T20 2018 match between England and South Africa at Darren Sammy Cricket Ground on November 16, 2018 in Gros Islet, Saint Lucia. 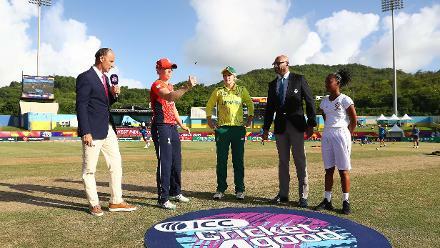 England warm up ahead ofthe ICC Women's World T20 2018 match between England and South Africa at Darren Sammy Cricket Ground on November 16, 2018 in Gros Islet, Saint Lucia. Shabnim Ismail of South Africa warms up ahead of the ICC Women's World T20 2018 match between England and South Africa at Darren Sammy Cricket Ground on November 16, 2018 in Gros Islet, Saint Lucia. 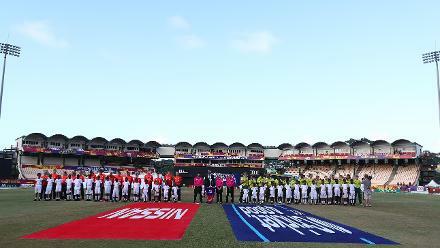 England line up against South Africa during the ICC Women's World T20 2018 match between England and South Africa at Darren Sammy Cricket Ground on November 16, 2018 in Gros Islet, Saint Lucia.